As the year comes to an end, it’s time to air some pet peeves about travelers and the travel industry, from menacing drones to endless fees to skinflint guests to “emotional support chicken.” My New Year’s resolution is to say only nice things. I promise. Jerks flying drones near the airport. We don’t have enough delays already? Even if the Gatwick drones were figments of multiple imaginations (authorities say there were 93 credible sightings), 140,000 people had flights canceled, holiday trips ruined or found themselves stranded, delayed or otherwise inconvenienced. Aircraft-drone collisions have already occurred; will 2019 bring the first fatality? Hotel resort fees. Resort fees appear to have been invented by hotel operators to create a pot of money they don’t have to share with online travel agencies, franchisers or anyone else. Resort fees typically include hotel Wi-Fi, access to the gym, pool (although you’ll still pay in the winter when the pool is closed) local phone calls (does anyone still call from a room phone?) and other dubious “goodies.” The fee can range up to $40 a night, and never appear on the booking cost of the hotel. But when you check out, your $100-a-night room is now $135. Resort fees may have been pioneered in Las Vegas, but they’ve spread to Orlando, San Francisco, Anaheim (Disneyland-adjacent), and New York where 85 hotels reportedly charge resort fees. In January, I’m reporting from the Consumer Electronics Show in Las Vegas, attended by 150,000 people. Accommodations are tight and I’m staying at the motor lodge at Circus Circus, on the low end of the MGM Resorts totem pole. Nonetheless, “a minimum mandatory hotel-imposed fee of at least $32.00 (plus applicable tax) per room, per day, will be charged and collected by the hotel at check-in or check-out.” Resort fees never seem to include parking; valet parking is $16 at Circus Circus. Yes, Europe is different and gratuities is included. But it isn’t in the USA, and dude, if you’ve got enough money to sit at a table or a bar stool, you’ve got enough to tip the waitress or bartender. I struggle with using the hotel bellman (that’s what roller bags are for) but if I have enough luggage to need one, I tip. And always leave a few bucks for the chambermaid—they’re not cleaning your toilet for fun. Fees vs. Fares. You’ve chosen a destination and priced it out on Kayak, Expedia, Google Flights or your favorite search engine or app. The base fare is X. But you want a seat assignment? To sit with your kids? Extra legroom? A place to store your bags? Food or a glass of water? Ka-ching! “Michael O’Leary has remarked throughout his tenure as CEO of Ryanair that fares could someday be zero; consumer air travel cost would be limited to a la carte fees and other ancillary revenue,” noted travel writer Chris McGinnis. Fees (“ancillary revenue”) are already a huge part of airline income. Spirit, for example, makes 46.6% of its annual income from them. While O’Leary is blunter than most, low-cost airlines like Ryanair, Spirit, Frontier and Norwegian are actually more honest about the fee-and-upgrade “process” than legacy carriers. With Norwegian, for example, a LowFare one-way from Los Angeles to London on January 24, 2019 is $215.90. The fare includes “1 carry-on bag (10 kg) and is non-refundable but can be changed for a fee.” For another $90, Norwegian will throw in up to two meals, a checked bag (20 kg) and a seat reservation. Other airlines prefer old-fashioned upselling. Delta calls it a win when 50% of passengers upgrade to a higher coach class ticket rather than deal with Basic Economy and its fees. I get it—consumers don’t want to pay higher fares. So airlines essentially “bait and switch” them, offering low fares, then charging for everything that’s been unbundled. Airline Boarding Policies Earlier this year, I was waiting to board an American flight. Around me were women with young children in strollers, people in military uniforms, and other apparent candidates for early boarding. Instead, the gate agents called for the Ruby, Platinum and Sapphires “elites”, and dozens of people scurried past clutching giant carry-ons. “I never knew there were so many kinds of gemstones,” someone next to me observed. In 2019, Delta will “simplify” the process by basically boarding everyone by the price paid. Gemstones (officially Delta One Diamond Medallion Members) board first, followed by First Class, Comfort, Sky Priority, Main Cabin 1, Main Cabin 2, Main Cabin 3, and at the back of the bus, Basic Economy. Defining Emotional Support Animals. A final “pet peeve” involves the battle over emotional support animals (ESA). In 2018, most airlines limited ESA animals to dogs and cats, and also insisted on a doctor’s note documenting the need for the animal. Airlines suspected some animal owners were using the ESA designation to avoid paying for pets in the cabin, interfering with the airline’s ability to collect fees (on United, $125 per pet each way). To others, getting an ESA vest and certificate seemed a less-than-rigorous process. Some owners tried to include a whole menagerie of creatures, from the emotional support marmoset wrongly accused of getting loose on a Frontier flight to Las Vegas, to the now-departed ESA peacock denied boarding by United. Airlines cracked down, saying no snakes, or pigs, monkeys, hamsters, ferrets or roosters on the plane. To some, this mocked travelers who depend on their support animals, while recalling Karl Marx’s maxim that history repeats itself, first as tragedy, second as farce. Predictably, PETA weighed in with outrage. But Popeye’s got what they wanted; controversy, publicity, and a shot at everyone’s favorite target, the airlines. Her goal is to turn her side jobs – her blog, YouTube channel and Etsy shop — into a personal brand. ■ Ride-hailing drivers: A credit card that earns a high rewards rate on gas can add up to hundreds of dollars annually for drivers. Before he switched to an electric car, Campbell was using his business credit card to earn 2 points per $1 spent on gas. But he also maximized savings by using the Shell Fuel Rewards program and special offers from Lyft. ■ Airbnb hosts: A rewards card that earns 5 percent back on spending categories that change quarterly could offer a significant return on any number of purchases to furnish or spruce up your Airbnb property. But you can also earn additional rewards by shopping with specific retailers on online shopping portals like Ebates, or via your credit card’s bonus mall. ■ Pet sitters: A flat-rate credit card that earns 2 percent back on all purchases can offer value at the pet store, or anywhere else. But you can also sign up for a pet store’s loyalty rewards program for additional discounts. The 14 Days of Fortnite Event is nearing the end as the Day 12 challenge is now live. 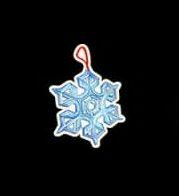 Leaks suggest that the the reward players will earn for completing the challenge will be a snowflake emoticon. We will be updating this article to confirm which reward has been issued to players that complete the challenge. There will only be two more challenges left for this event and so only two more rewards to earn. You will need to make sure you complete the challenges in time to receive the rewards as these rewards can only be earned from this event. 3 Smart Ways to Market Travel to Millennials in 2019 – Inc. In 2018, travel and tourism was a ~$1.5 trillion industry. By 2028, it’s projected to grow to $2.4 trillion. And a good chunk of those contributing to those trillions are Millennials–a group that has now become the largest generation of travelers. In fact, Millennials (aged ~21-38 in 2019) now represent $50 billion worth of travel consumerism in the U.S. alone. Credit cards don’t just help build your credit score; they also offer a range of perks. That’s why various experts recommend that you use credit instead of debit in many situations, such as when you’re making a big purchase or traveling. When used responsibly — so, as long as you don’t spend wildly and you avoid interest by paying off your balances — a top credit card can save the average American hundreds of dollars every year. Here are three simple ways you can use credit cards to save money in 2019. The simplest way that credit cards earn you money is by rewarding your spending. Many cards offer flat rates of cash back, such that you earn the same percentage back for any purchase you make. Other cards reward different categories of spending with different rates. The Blue Cash Everyday, for instance, offers 3 percent back at grocery stores, 2 percent back at gas stations and some U.S. department stores, and 1 percent on all other purchases. Other cards offer rewards points or miles. Typically 1 point or mile comes out to be worth a penny, so 100 points = $1. But with many cards, you’ll be able to choose between various redemption options — cash back, merchandise, travel purchases, donations — and which option you go with can affect the value of the rewards. Experts tend to agree that, to get the most out of your points when you have so many options to choose from, you have to transfer your points to one of your issuer’s travel partners and then scavenge for a great deal on a flight or hotel stay. When you do that, points or miles can be worth as much as 7 cents apiece. One survey found that an enticing sign-up bonus is the primary motivation for a quarter of the people who get new cards. That’s because many bonuses are substantial, and it’s usually not too difficult to qualify for them. For example, if you spend $4,000 on purchases in the first three months of getting the Citi ThankYou Premier card, you get 50,000 points. That’s worth $625 when redeemed on travel. There are a couple things to keep in mind, though. For one, you usually don’t qualify for a bonus if your new card is the same brand as one that’s already in your wallet. If you apply for the ThankYou Premier card, for example, but opened or closed a Citi ThankYou Preferred or Citi Prestige card in the past two years, the bonus won’t be available. And trying to game the system might work against you. Repeatedly applying for cards, collecting the bonus after a few months and then canceling the cards to avoid having to pay the annual fee could lower your credit score. These last two credit card perks are somewhat lesser-known, but both can save you a lot of money, as long as you’re aware of them. Some cards offer price protection, meaning that, if you buy an item on your credit card and then its price drops within a set time frame, usually a month or two, you can get refunded the difference. But that requires you to submit a claim form. FORT LAUDERDALE, Fla.—Since Tua Tagovailoa hit DeVonta Smith to win the national championship, former starting quarterback Jalen Hurts’ future with the team was a question. Some predicted that he would leave before the season started. With the new redshirt rule, players can play in four games and maintain that year of eligibility . Other big-name players have chosen to play the four games and leave with a redshirt. People thought he would sit out the season after the fourth game. “He’s always put the team first,” head coach Nick Saban said. “He’s gone in the game whenever we’ve asked him to go into the game. We played him as much as we could so that, if this came up, he was going to be ready. I think it worked out great, and I think this is a great example of why guys don’t need to run off and just transfer every chance they get or every time something doesn’t work out. Fans that once groaned or booed him changed their opinion, especially when he trotted out onto the field in the Iron Bowl, when Bryant-Denny Stadium reached its peak, or close to it, stadium noise. When Alabama played in the SEC Championship game in early December, it was almost déjà vu of the national championship. The backup came into the game and led the Crimson Tide to a close win. Three-hundred twenty-seven days before Hurts led the comeback, he was replaced after throwing for just 21 yards. In the SEC Championship, he threw for 83 yards on his two drives. “It felt so good to see that happen to him,” outside linebacker Christian Miller said. “I had talked to him during the summer and stuff… and I told him ‘Just trust it. Just trust it. You never know when you’re going to be called or what can happen.’ It’s crazy that this ended up happening. If you asked me back then, I wouldn’t have guessed this. After the win, Saban said that he’s never been prouder of a player than Hurts. It’s hard to imagine the quiet 6-foot-2 quarterback not starting. Since his freshman year, he started all but one game for Alabama, winning 26 of the 28 games and leading the Crimson Tide to two national championships. When Tagovailoa jogged to the field against Louisville, he was officially named the starting quarterback, and with his play he has cemented his name into that spot. While most people would be mad about losing that job that he excelled at, Hurts just went to work and continued to develop. “I think every day I wake up trying to be a better version of me,” he said. He continued to compete for the job, but as a team leader, he wanted Tagovailoa to feel like the starter. When Alabama warms up for practice, it lines up by depth chart position. Hurts told Tagovailoa to go to the front of the line, but Tagovailoa wouldn’t go, saying it was Hurts’ spot. Besides his role changing on the field there were two big changes for Hurts since the overtime win against Georgia in the title game. The first came 13 days after the win. Hurts’ signature look was his dreadlocks that he had grown out since he was 10. He nearly cut them, but he made a deal that Alabama had to win the national championship before the cut. “I had been kind of wanting to cut it, I just needed a reason to,” Hurts said. On Dec. 15, he walked across the stage in Coleman Coliseum with his bachelor’s degree in public relations. As he walked, the people in attendance stood and applauded. WEST SPRINGFIELD, Mass. (WWLP) – The Christmas rush may be over but according to Triple A we are still in the busiest travel season. Right now, there are a few types of travelers on the roads – the ones going about their day to day business, and then those who are either returning from their holiday destinations, or who are traveling to celebrate the new year. Triple A estimates that a record breaking number of people are expected to travel for the holidays this year. Some by car, others by train or bus. One woman told 22News, the roads have been busy since last weekend, but she's more concerned about how safe they will be this coming Monday night for New Year's Eve. "Everybody really needs to be careful," said Teresa Godfrey. "Drinking, or even being tired from jobs that they're working through the holiday. It's excruciating for a lot of people." MassDOT is reminding drivers to be safe and find a sober ride home on New Year's Eve. MassDOT is also offering free MBTA service after 8:00 p.m. on Monday evening. There are also taxis, and ride-sharing apps like Uber or Lyft that people can use for a sober ride. Triple A says the busy, year end travel period officially ends on New Year's Day. This includes lost, stolen and seemingly useless cards you threw away in the trash. Recently, Mead busted a Delray Beach man for reprogramming credit cards with stolen information. “When we swiped the magnetic stripe, the number that showed up on the screen did not match the number that was embossed on the front [of the cards],” said Mead. 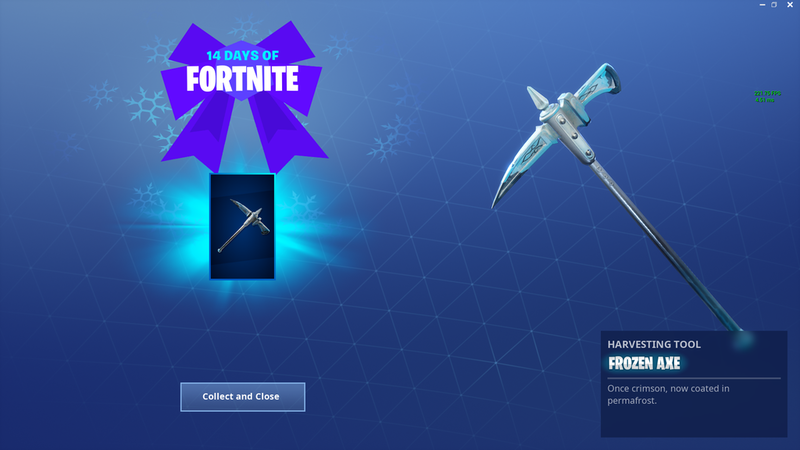 The eleventh day of the 14 Days of Fortnite is now live. Here is the challenge and reward for completing the challenge. 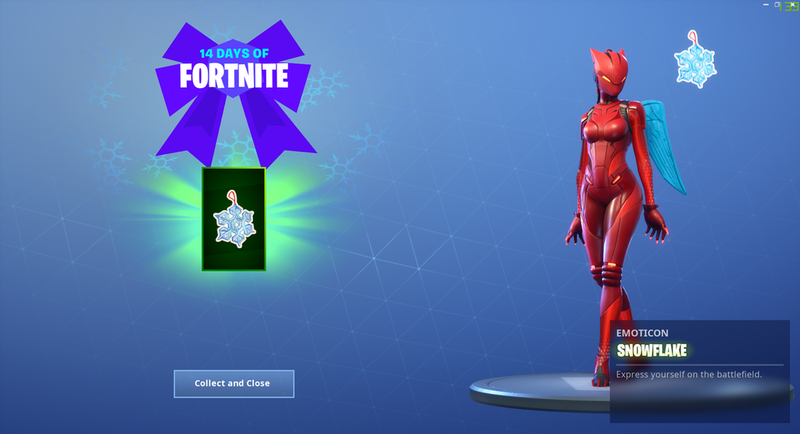 The 14 Days of Fortnite Event has been introduced to the game in the festive season and players are able to gain a new reward each day by completing the set challenge. 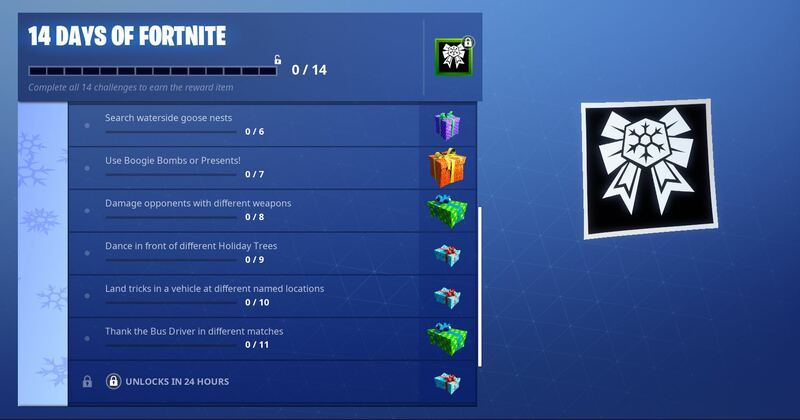 The challenges for the event has previously been leaked, but the order of the challenges were not known. All of the rewards had also been leaked, but can only be confirmed once they have been awarded to players. 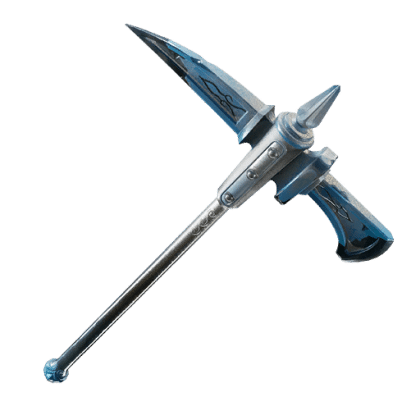 The Frozen Axe is of Rare rarity and has the description, “Once crimson, now coated in permafrost”. This item complements the Frozen Legends Pack items, which is available to purchase in-store now. There are now only three more days of the event left and so you do not have much time to complete the challenges and claim your rewards. These rewards will be limited-time cosmetics and you will not be able to complete the challenges and receive any rewards after the event has ended. You can read more about how long you have to complete the challenges here. Air Canada flight 759 was carrying 135 passengers when it nearly crashed into 4 jets while attempting to land at SFO. This post includes a video of the incident and statements from SFO on their new safety improvements. 2018 was a year full of wonderful, scary, frustrating and unusual travel stories. We’ve been stunned by fare deals to Hawaii, frightened by near misses at SFO, amazed seeing more travelers dragged off planes, and much more. 2018 was also the first full year of TravelSkills on SFGate 🙂 Our new platform and distribution have helped us inform and assist millions of travelers in California and across the country on other Hearst news sites such as the Houston Chronicle, the Seattle Post Intelligencer, the San Antonio Express news and of course, the San Francisco Chronicle. Thanks for reading! If you have not already done so, be sure to sign up for our free bi-weekly travel news email updates. Let’s take a look at our ten most-read posts in the last year- you can see them below, or via the slideshow at the top of this post. An American passenger refused to leave business class and return to her assigned economy seat, so Korean Air removed her from the flight. Delayed delivery of new A321neo aircraft caused Hawaiian Airlines to cancel hundreds of summer flights, including two new non-stop services from Oakland. Allison Preiss was unable to board her oversold United flight since she was the lowest fare passenger and got a $10,000 voucher out of it. Check out her tweets about the incident and our Q&A with her in this post. Californians got new options and a new look for their ID cards in 2018. The new REAL ID compliant driver’s licenses and ID cards are ideal for travelers since standard ID cards will not be accepted at airport security after October 2020. Take a peek at the crew rest areas on United Airlines, Cathay Pacific, Singapore Airlines, and more. TravelSkills readers were tired of waiting for a gate when landing at SFO, so we asked SFO and United Airlines about it and they gave some insight on the issue. Details of Southwest’s new Hawaii service including info on routes, aircraft, and on-board food. Alaska and United trimmed down their Bay Area routes in August while other airlines started planning their 2019 transatlantic schedules. What were the most important or interesting travel stories to you in the last year? How did we help inform or assist you in getting a great travel deal, a comfortable seat or fast passage through the airport? Let us know in the comments! Thanks and happy New Year!